Common magical lore divides physical existence into four basic elements; Air, Earth, Fire, and Water. By manipulating these elements, Elementalists create some of the most spectacular effects of magic, raising walls of stone around themselves or raining fiery death upon their enemies. Unlike practitioners of common magic who barely touch the power of the elements and Priests whose powers come from the Gods, sorcerers master the raw elemental forces without permission and, most of the time, even without acknowledgement. By enhancing a sword with Fireblade or using Breathe Water, all magic users are elementalists in a way. Their knowledge, however, is limited to the strictly defined spells they learn from their communities, churches and sorcerous orders. Beyond that basic knowledge, there are those who dare a greater understanding of the elements and walk the Four Elemental Ways gaining power over the building blocks of the universe. Elementalism is the latest volume of the Arcania of Legend series, presenting a new way of looking at elementalism. Designed to slot seamlessly into any fantasy-based Legend game, these sourcebooks enhance and expand the use of magic, adding a new dimension to campaigns. 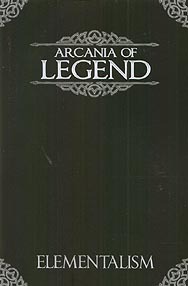 Each Arcania of Legend book is not intended just for Games Masters to use in conjunction with their non-player characters, players themselves will find full details on how to use the magic systems with new or existing characters, greatly increasing the wealth of options the core rulebooks present them with.